The Adelaide Sailing Club is bringing the iconic Fisher Peterson Tillett Regatta back to its home on the Patawalonga Lake. South Australia’s longest-running junior sailing event returns to its roots next weekend when the 52nd Fisher Peterson Tillett Regatta takes place on the Patawalonga Lake on Sunday 7 April. Originating on the lake as an event for juniors in the Holdfast Trainer class, the event has grown to become one of the most recognised junior events in the country at its home of Adelaide Sailing Club, and pays homage to three iconic South Australian sailing families. Largs Bay Sailing Club’s founding Commodore Tom Fisher created the Holdfast Trainer class in the early 1900s, which paved the way for junior sailing in South Australia and blooded some of the state’s most talented sailors. ASC coach Matt Young with an excited youngster. A regatta was created in his honour by his son Arthur and was then built to honour the champion ‘Holdy’ of the regatta. The Peterson Trophy was later introduced for the intermediate 303 class, followed by the Tillett trophy for the International Cadet class. Both named after iconic figures in the South Australian sailing community, Max Peterson for the 303 champion trophy, and International Cadet champions Chris and David Tillett. 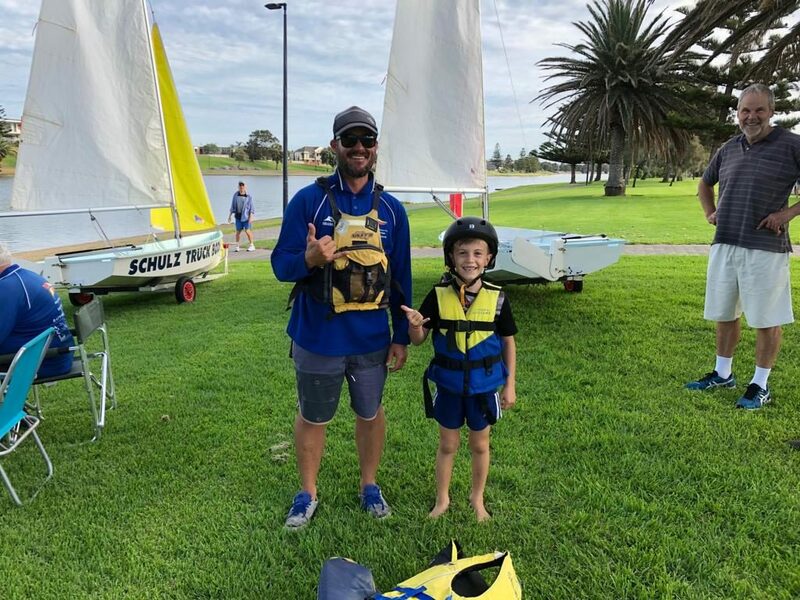 After many years of competition on the Patawalonga, the event was moved to the Glenelg and Adelaide sailing clubs where it became a prominent youth championship regatta for even more classes. The club’s recent Discover Sailing Day on the Pat drew adults and juniors alike sailing in Tackers boats and Pacers. 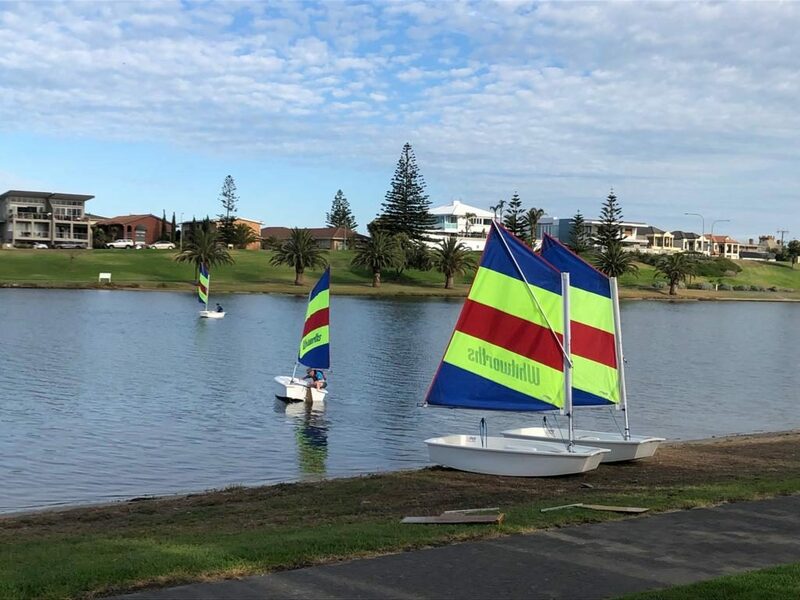 This year the Adelaide Sailing Club has taken the opportunity to move back to ‘the Pat’ and focus on the younger developing sailors, using the event as a training and showcase regatta. Adelaide Sailing Club Commodore Peter Royle said it was a nostalgic feeling for the club to return to the Patawalonga for the Fisher Peterson Tillett Regatta, a lake with a rich history in the state’s junior sailing landscape. “This event has seen some our state’s biggest names in sailing compete,” Peter said. “Bringing this event back to the Pat takes us back to our roots and also gives us some inspiration to develop more of our next generation of sailors. “It is also a chance for us to showcase what we do in a much busier area of the Glenelg precinct. The club recently hosted a Discover Sailing Day on the Pat and Peter said there was a lot of walk-in traffic from the area that were interested in getting involved in sailing. For more information about the Fisher Peterson Tillett event, head to the Adelaide Sailing Club website. To register for the event, click here. All welcome!